How To Troubleshoot Local Ranking Failures In 2018? Chennai Seo Company Blog - Get Seo Tips From Experts! Google local Business rankings get directly affected by lots of factors, and since we’re in 2018, there are some guidelines that you might want to reconsider because that could be the reason of your local business not listed on Google. There could be numerous other reasons also, and most of them are technical and require just 15-20 minutes of time to rectify. 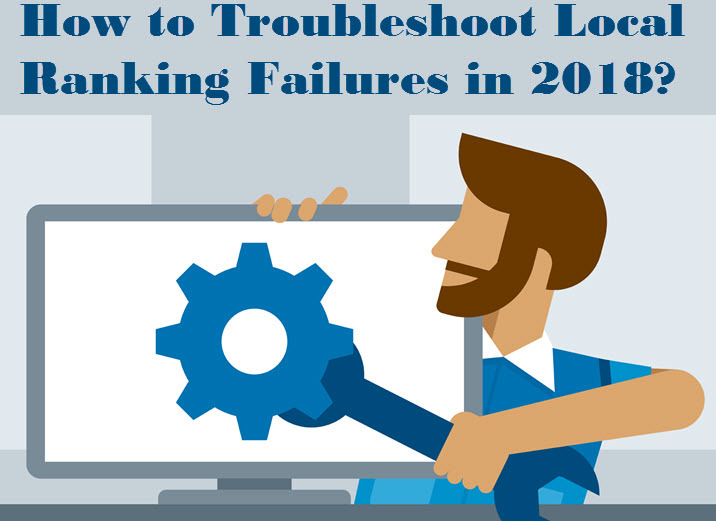 Let’s head to ways you can troubleshoot local ranking failures and get back your ranking. There is a solid chance that Google has changed its ranking system or just a minor change which can affect your business ranking. You should be thorough with the updates and can take help of various up to date blogs to see whether the ranking is hit by some update. Check Google my Business Forum for an update, you can also check Search Engine land and Moz blog, all of them will provide you deep insights on the updates if there are any. There is a probability that the local business hasn’t given all the necessary information, like actual address, or phone number which is working 24*7, or which keyword they have to optimize the result for. You have to be clear about the city your business is dealing in because Google goes really specific about the location, so bear in mind the details. As updates are subjected to change, so are the guidelines, but they are not that often changed, but if your ranking was there and suddenly has gone off, you should check with the guidelines, as these guidelines are technical errors which can be corrected with little efforts. Also, if Google thinks that you have spammed the guidelines, even unintentionally, by stuffing keywords, or wrong URL implementation, then your ranking is going to get dropped. Check with the guidelines and try not to spam it. There are two types of suspensions, soft and hard. Talking about soft, it can be rectified, and only a matter of few guidelines being checked, or any other reason which could unverify the ranking. But hard suspensions can permanently unverify your ranking, and leave you with no control, now the only help you can get is by reporting it to Google My business forum. Hard suspensions are the result of some serious spamming and guidelines violation, so be careful with them. You can check if anything in your listing is missing, and is that a cause for not present in the search. You can use tools like MOZ check Listing. Your listing simply is not ranked higher because of the organic authority. Metrics like page authority, Domain Authority, and backlinks work, so do have a look at it by installing Moz SEO toolbar. Google recently experimented with these and suddenly people with businesses having home addresses listing faced the consequences. The project makes the google a middleman between service providers and customers. You can check if LSA is implemented in your city or not. If yes, then you simply have to pay for the program to get your business at the desired place. The post How To Troubleshoot Local Ranking Failures In 2018? appeared first on Chennai SEO Company Blog. Subscribe to Chennai Seo Company Blog - Get Seo Tips From Experts!